We lost our cat Fergie about 2 months ago. Maddie was quite sad about this. We did what we could to find her but, we were not able to. We recieved a call one day from a family that lived on the other side of Spring Hill, who said they saw our add about our missing cat and they think they had found her. So, we loaded up the car and took about a 15 minute trip to there house. We honestly could not tell if the cat was Fergie or not. She looks a lot like Fergie. The family said that if it was not Fergie they did not want to keep her so we decided to take her home. Maddie was thrilled. Tasha our Pit Bull, who by the way is an angel, loved her too. As the night went on we realized that this cat was definetly not Fergie. 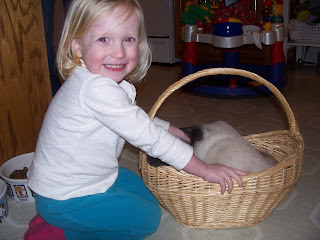 The family we got her from had a little girl who named the cat Lucy. I looked at Tone and said "This is not Fergie! Do we keep her?!" We decided to keep her and call her Lucy. Lucy has turned out to be an awesome cat who climbs on everything and I mean everything! Maddie carries her everywhere and is so happy to have her as part of our family. Hi friend! So glad you are doing this little blog! I must tell you that this story had me laughing out loud! Welcome to the family Lucy....(but poor Fergie, eh?) I had no idea you all had lost her....kinda sad, huh! Well, I do hope little miss Lucy fits well in her new home! Love you so much!